WELCOME to the GIRsite!!! Look around see the photos of Gir. Some little notes for looking at. As some of you may know, Gir is INSANE. Zim his leader or master or commander or whatever tells him what to do. But Gir will mess it up some how. I just know it! Make sure you check out the page, "The Gir News." and look at my other websites like, www.thegreenzim.yolasite.com I hope you enjoy learning about Gir. To learn more about Gir, go to About Gir! Gir a wacky,insane, robot is a minion to Zim, on there mission to destroy earth! 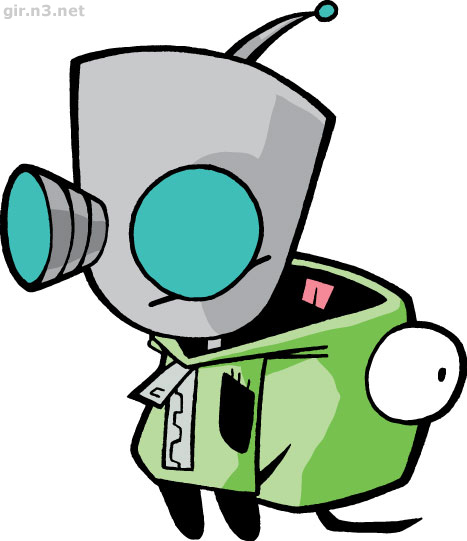 Gir is seen both with and without his dog suit. Really Gir is a robot but he is mainly seen with his dog suit!